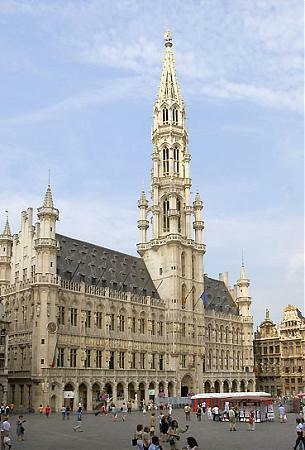 The Town Hall of the City of Brussels is a Gothic building from the Middle Ages. 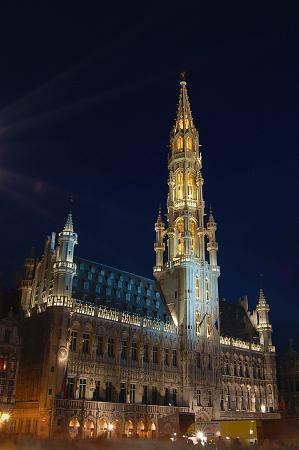 It is located on the famous Grand Place in Brussels, Belgium. The oldest part of the present Town Hall is its east wing (to the right when facing the front). 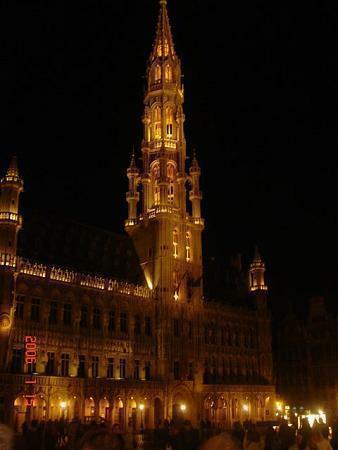 This wing, together with a shorter belfry, was built and completed in 1420 under direction of Jacob van Thienen. Initially, future expansion of the building was not foreseen, however, the admission of the craft guilds into the traditionally patrician city government apparently spurred interest in providing more room the building. As a result a second, somewhat longer wing was built on to the existing structure, with Charles the Bold laying its first stone in 1444. The this "left" wing was built by Guillaume (Willem) de Voghel who in 1452 also built the Magna Aula at the Coudenberg. The facade is decorated with numerous statues representing nobles, saints, and allegorical figures. 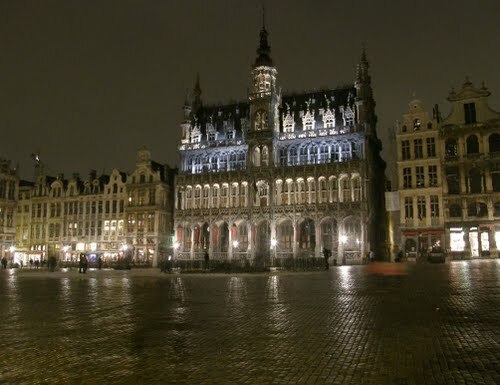 The present sculptures are reproductions; the older ones are in the city museum in the "King's House" across the Grand Place. The 96 metre (310 ft) high tower in Brabantine Gothic style emerged from the plans of Jan van Ruysbroek, the court architect of Philip the Good. By 1454 this tower replacing the older belfry was complete. Above the roof of the Town Hall, the square tower body narrows to a lavishly pinnacled octagonal openwork. 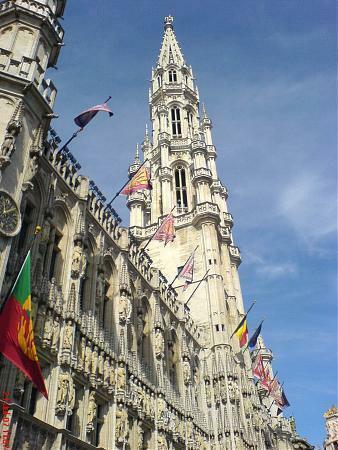 Atop the spire stands a 5-metre-high gilt metal statue of the archangel Michael, patron saint of Brussels, slaying a dragon or devil. The tower, its front archway and the main building facade are conspicuously off-centre relative to one another. According to legend, the architect upon discovering this "error" leapt to his death from the tower. More likely, the asymmetry of the Town Hall was an accepted consequence of the scattered construction history and space constraints. 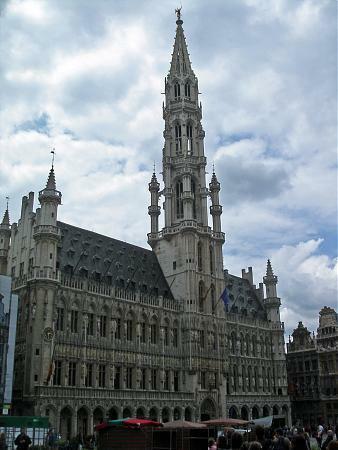 After the bombardment of Brussels in 1695 by a French army under the Duke of Villeroi, the resulting fire completely gutted the Town Hall, destroying the archives and the art collections. The interior was soon rebuilt, and the addition of two rear wings transformed the L-shaped building into its present configuration: a quadrilateral with an inner courtyard completed by Corneille Van Nerven in 1712. The Gothic interior was revised by Victor Jamar in 1868 in the style of his mentor Viollet-le-Duc. The halls have been replenished with tapestries, paintings, and sculptures, largely representing subjects of importance in local and regional history. The Town Hall accommodated not only the municipal authorities of the city, but until 1795 also the States of Brabant. In 1830, a provisional government assembled here during the attempt of the Third French Revolution which provoked the separation of the Southern Netherlands from the Northern Netherlands. resulting in the formation of Belgium as is known presently.